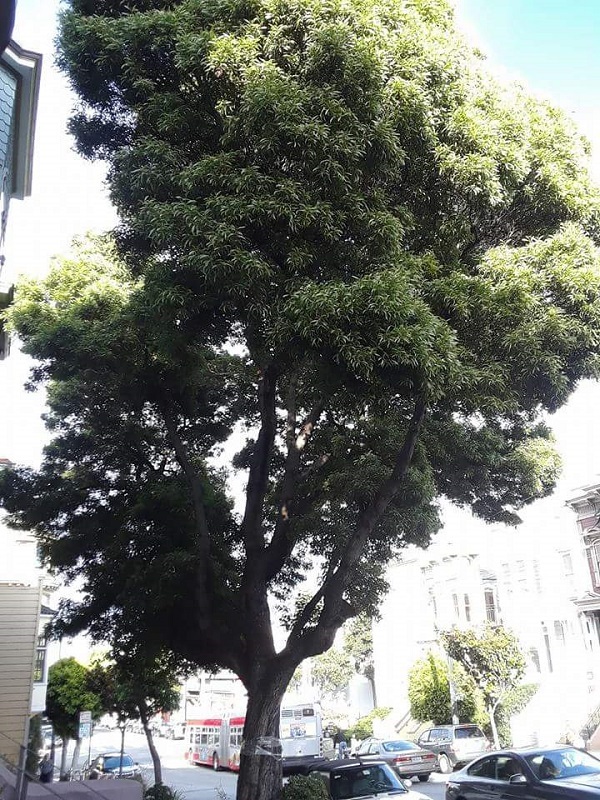 In a little bit of good news, we recently received this letter from a supporters, telling of a possibly successful attempt to save a street tree on Haight Street, San Francisco CA. It’s published with permission. 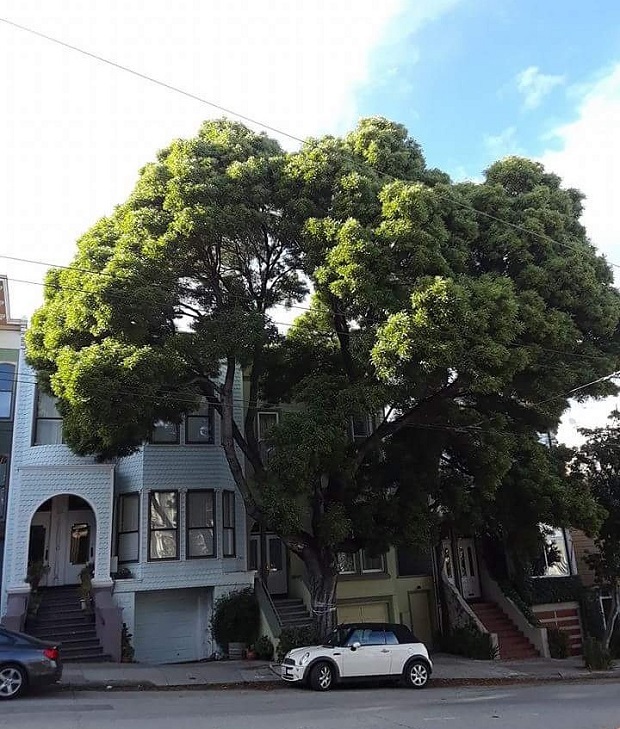 Another partial win for a critical component of our urban forest — street trees, in this case a lone blackwood acacia at 826 Haight Street facing removal. The other day DPW [Department of Public Works] head Muhammed Nuru reversed a request to remove the tree after a Public Hearing was held for neighbors protesting its imminent removal. The tree removal order was overturned, delayed for 90 days while BUF reassesses every means of saving this healthy, mature tree including construction of a larger basin and sidewalk repair that slopes to accommodate the tree roots and base. See below for a copy of the decision #186300. The decision urges BUF [Bureau of Urban Forestry] to consider all means to keep the tree in place and report back in 90 days. The Bureau of Urban Forestry is starting to take notice of our objections to the summary removal of mature street trees after being schooled in the multiple benefits of a large urban forest canopy from the perspective of climate change, carbon sequestration, respiratory health, wildlife habitat, drainage, heating/cooling and mental health. BUF has seen the necessity of taking a deeper dive into their usual standard operating procedure of posting a removal notice without seeing a stewardship role prioritizing street trees, especially after our opposition and intervention with Guy Place Park, 75 Howard Street and this lone acacia tree. We organized 20 written protests, a change.org petition with 117 signatures and 5 neighbors giving oral testimony. The organizing tool was Next Door. Hopefully, this signals a small beginning and recognition by BUF and RPD of the need to preserve and expand each component in our dwindling urban forest canopy volume. And perhaps this can influence the City’s new responsibilities under Prop E and the minimalist approach both City Planning and MTA takes with area plans and streetscape improvement projects occurring throughout the City. The Bureau of Urban Forestry is starting to take notice of our objections to the summary removal of mature street trees after being schooled in the multiple benefits of a large urban forest canopy from the perspective of climate change, carbon sequestration, respiratory health, wildlife habitat, drainage, heating/cooling and mental health. We organized 20 written protests, a change.org petition and 5 neighbors giving oral testimony. “The Director of Public Works held a Public Hearing on Monday, July 24, 2017 at City Hall to consider Order No. 186127 for the removal with replacement of one (1) street tree adjacent to the property at 826 Haight Street. 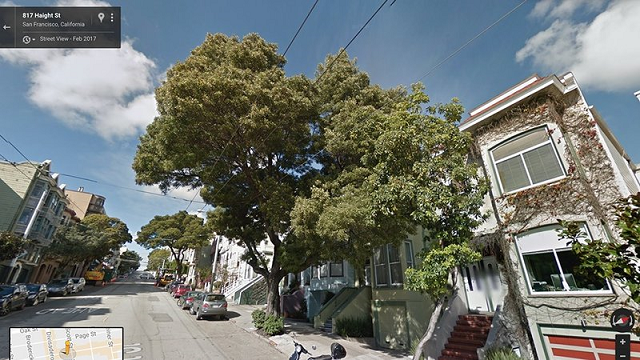 “Findings: Urban Forestry staff testified that the tree was initially posted for removal due to its age, species, structure, and sidewalk condition. Blackwood acacia, Acacia melanoxylon, does not tolerate root pruning well, once the root’s of a mature blackwood acacia are significantly pruned they tend to rot quickly. The accelerated root rot can often lead to full tree failures. Currently, the sidewalk is in poor condition, and must be repaired. The main branch union has poor structure, and all of the co-dominant scaffolding branches originate from the same location on the trunk, which can lead to large stem failures. Urban Forestry staff stated that if the tree were to remain, the sidewalk repair would have to be carefully completed without cutting any roots. The tree basin would also have to be expanded to at least 6’x12′. The canopy should be thinned & large scaffold branches with the worst structure should be removed or the weight reduced. “The Bureau of Urban Forestry received approximately 20 removal protests from the public in writing, and five (5) members of the public spoke at the hearing against tree removal. A change.org petition was also created which received 117 supporters against tree removal. After the tree hearing Urban Forestry staff surveyed the underground utilities near the tree. It was found that high voltage electric lines run directly beneath the tree basin, and if removed, the tree will not be able to be replaced. So it’s not over yet, but we’re very encouraged that a good faith effort is being made to save this tree. Thanks, Matthew and everyone who worked on this.